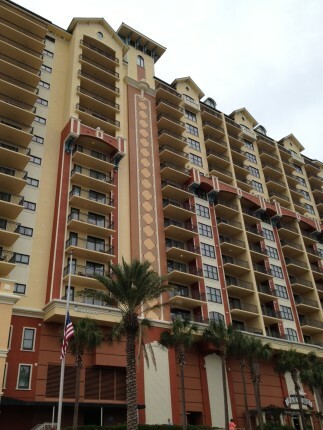 This post is brought to you by Emerald Grande at HarborWalk Village in Destin, Florida. I’m spending the weekend getting to know some really great bloggers in person. I have been talking to these women online, in the Momdot Forum, for several years, I can’t remember how many it has been. The event planner, Trisha from Momdot, decided to host a giveaway for one of the tickets, and to my surprise, my name was chosen as the winner! I was so excited to be able to come to Destin, Florida, on the Emerald Coast, to finally meet my mentors and friends. I will be writing several more posts about the weekend, including about the lodging, the food, the activities, and more. But, I couldn’t wait to show you the fabulous Emerald Grande at HarborWalk Village, where we are staying. 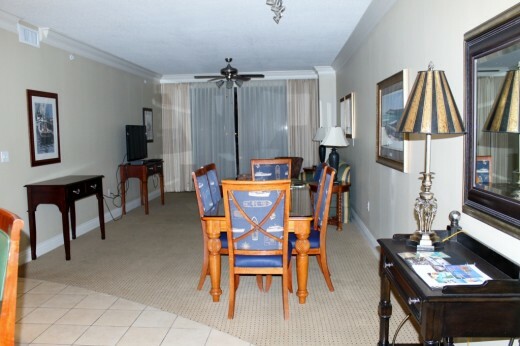 When you open the door to this three bedroom, three bath condo at Emerald Grande, the first thing you see is the huge dining and living area. There is a dining table for six, a couple of desks, a sofa and chairs, and a large TV. A sliding door leads out to a balcony with a great view. The living room furniture is both beautiful and comfortable. 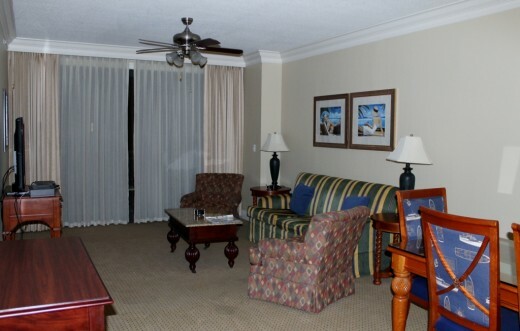 This common area is great for catching up with friends or family members after a day spent out and about at HarborWalk, taking in the sights, or relaxing on the beach. 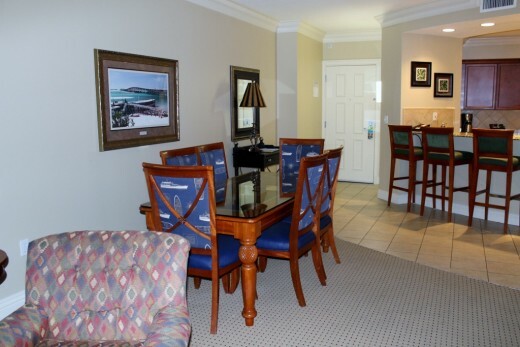 There are several restaurants on the property, and many many more in the town of Destin, but if you want to eat in, the kitchen is furnished with everything you would need to cook a nice dinner. The dining table seats six, and if you have friends over to eat with you, there is seating for a few more at the kitchen bar. There is a huge side by side refrigerator with an ice maker; a microwave; a full size range with oven; a dishwasher; a coffee maker; and a toaster. A double sink over by the wall, and a bar sink too! This kitchen is huge too! And look! a wine rack built in. This place has thought of everything! It is the smallest of the three, but has a closet with a light, a ceiling fan, a chest of drawers, and a chair. 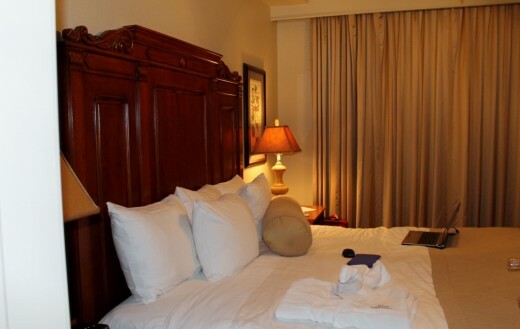 The bed is just as comfortable as the larger one in the Master Bedroom. That chest of drawers will hold enough changes of clothing for two children for a week! Or enough for one blogger for a weekend! Did I mention that this is a three bedroom, three bath condo? 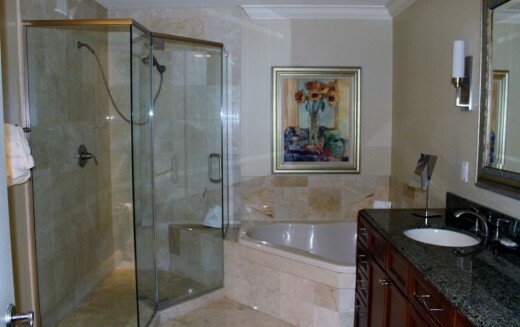 This bath is shared with the small bedroom and the living area, and has a walk in shower. It has a queen bed, a dresser, and a chair. There is a door leading to the balcony. 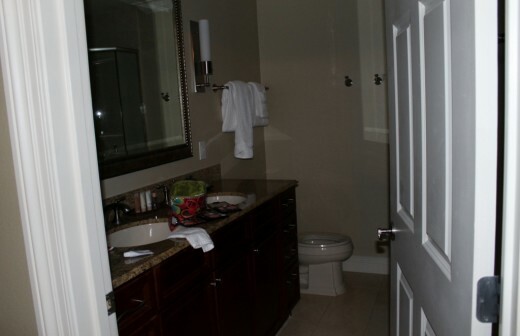 This is a private bathroom , and has a walk in shower. 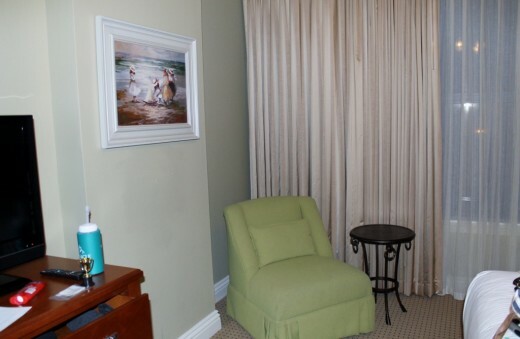 A nice comfy chair, with a side table completes the furnishings in this bedroom. 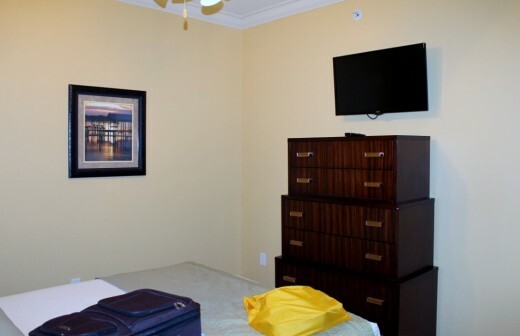 All of the rooms have beautiful artwork on the walls. It makes the whole place seem homey, and comfortable. The master bedroom. 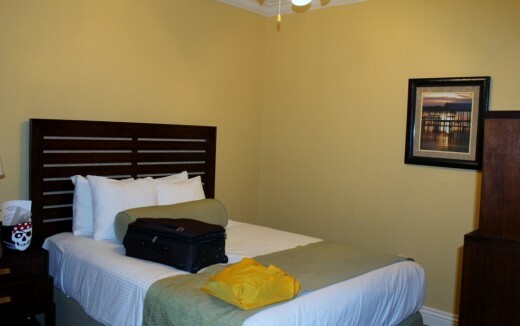 All of the bedrooms have ceiling fans, a chair, and a side table. 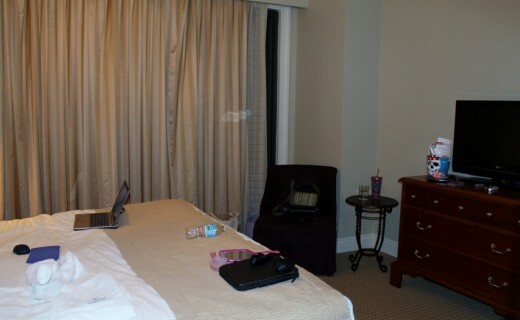 In this room there is a full length mirror on the wall. There’s a king size bed. Two night stands, a large dresser, and a side chair with a table. I could live here forever! Another view of the bed. Isn’t it gorgeous? The most important part though, is the comfort. Holy Moly, look at that bathroom! I wish I could pack it up in my suitcase and take it home with me. The walk in shower is exactly what I want in my house. And the garden tub would be so nice for a bubble bath! And unlike so many hotel bathrooms I have been in, there is plenty of room to move around in there. There are even two sinks. You and your hubby can get ready for the day at the same time. Or not. 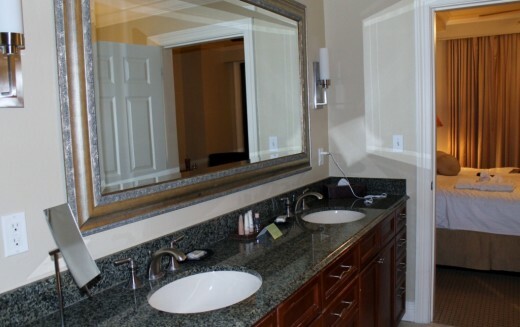 But, having such a huge counter space means you can put all your toiletries out and not be crowded up. I have been impressed with the Emerald Grande so far, and I haven’t even slept here yet. I love that it has separate bedrooms, and that you can shut your door if you don’t want to be disturbed by your roommates, or leave it open to invite them in. There is just so much to like about it. 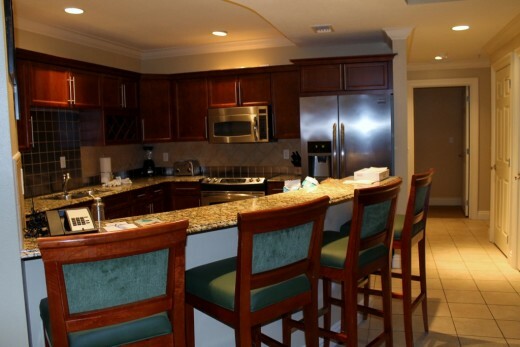 To find out more about Emerald Grande at HarborWalk Village in Destin, you can read more about their accommodations here. They are on Facebook, Twitter, Instagram, and Pinterest too. Wow, what a great place to stay. Looking forward to more about this trip. Oh wow, what beautiful accomodations! That bathroom is right up my alley, especially that luxury shower. What a lovely place to stay! I hope you have a great trip and I can’t wait to see the rest of your posts. That’s definitely vacationing in style! I’d love to stay someplace like that with so much room to spread out! Congratulations on the win! It looks like a beautiful place to get away from it all while still getting into all kinds of great things! Such a great room set up for a family. I love the spacious eating area and the kitchen. It’s like having a apartment. So much more comfortable. Destin is a gorgeous place. We went there once, and I couldn’t believe how gorgeous it was. 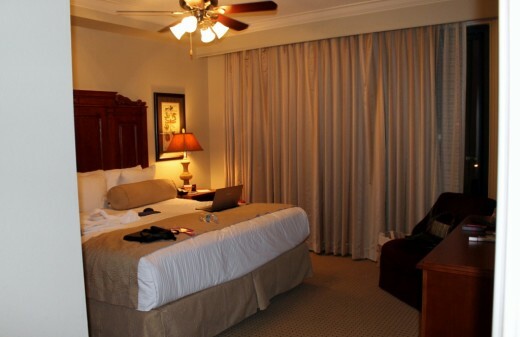 That looks like a nice room to stay while vacationing there. 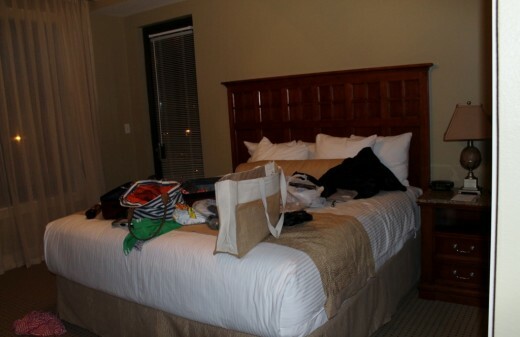 The accommodations look lovely. I’ve never been to Destin, but it looks like someplace my family would enjoy visiting. I love to stay in vacation homes when I travel. It is much more comfortable and allows my family to stretch out and relax. Can’t wait to hear more about your trip. Looks like a great place to stay! I wish I could have gone to Brandcation this year but alas, it wasn’t in my budget. What an awesome place to stay. It will be great to read up on how the next few days of the event go. What an amazing hotel to stay in – looks beautiful! I can’t wait to hear more about the trip! This looks like an awesome place to stay. I have not been to Florida since 2004, makes me miss it! It was so great to meet you!! I love the chest of drawers in the first bedroom! 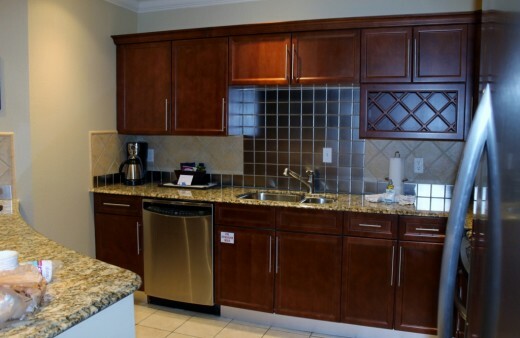 I loved that each condo was similar but had different furnishings! I’m so jealous! I wanted to go so bad but I’m glad you loved the hotel! Very nice! I haven’t been to Destin in forever. Congrats on your won!